We build you an amazing website that helps you educate and acquire new patients, manage your online reputation and create campaigns to market your service. 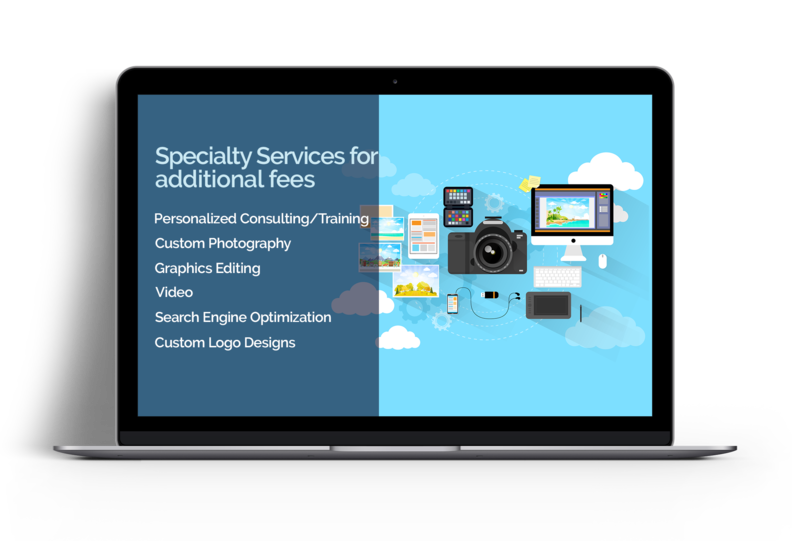 In addition to our marketing platform, for an additional fee, we can provide personalized consulting to individuals who need technology-related and domain-related advice or training. Professional photography can take your brand to the next level. Photos of your offices, staff, and patients (for testimonials) will differentiate you from your competition. We partner with Marilyn Garrison Photography, a premier photographer who specializes in making websites truly special. You may already have great photography we can leverage on your website. We can take those photos and edit them to look amazing. Video takes marketing your dental practice to a new level. Video engages both visual and auditory senses...allowing you to communicate more information about your practice in a way anyone can easily understand. Consider videos of your patients, a tour of your office, a discussion of more complex procedures, or anything that will help your patient accept the treatment plans you propose. Website keywords are only one component of SEO. We offer additional SEO services for helping you find backlinks to your site, and actively look for ways to push your website to the top of the search engine rankings beyond what our marketing platform provides. We offer custom logo solutions that you can choose from as well as we can also change the color, shape, font, etc. of your current logo if needed.